As a gentle Christmas ode to friendship and hope, writers Stan Zimmerman and Christian McLaughlin return with their role-reversal, holiday comedy, Yes, Virginia (based on Zimmerman’s mother and his long-time housekeeper), starring double Emmy nominee Mindy Sterling (Austin Powers) and Broadway & TV actress Arnetia Walker (The Wiz, Dreamgirls, Nurses), bent on instigating spontaneous laughs, sweet sighs and cheery tears. Skipping holiday nostalgia for good old fashion humanism and occasional ‘oh-yes-she-did’ humor, Yes, Virginia embraces what should be a very ordinary day of two aging women on the verge of life changes, physical (Denise has macular degeneration) and mental (Virginia is dealing with the onset of dementia), but trying very hard not to succumb to everyone else’s ideas about how they should live out the remainder of their lives (which could in fact be a really, really long time!). They are both looking for options for self-care. Denise (Sterling) a retired accountant is home alone on New Year’s Eve when her former housekeeper Virginia (Walker) unexpectedly shows up to clean the house. Strange, because Denise laid Virginia off a couple of months ago over lunch, and the two haven’t seen each other since. As Virginia goes about her normal tasks, Denise secretly scrambles to discover what’s really going on until a crash, bang and very vocal plea for help come from the kitchen. Virginia has sprained her ankle and cannot move. Uncomfortably stuck in the situation, Denise tries to get a reluctant Virginia to tell her what’s really going on. 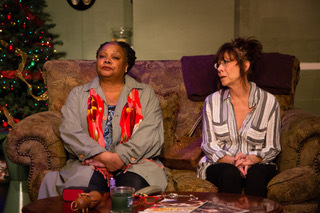 Directed by Zimmerman and produced by Stefani Nicole Von Huben and Pop-Up Playhouse, Yes, Virginia is delightful even in its verbosity, offering warm, soothing, real-time entertainment, smack in the middle of the holiday insanity. It’s a chance to experience an authentic, non-dramatized older population reality without hyperbolic melodrama.